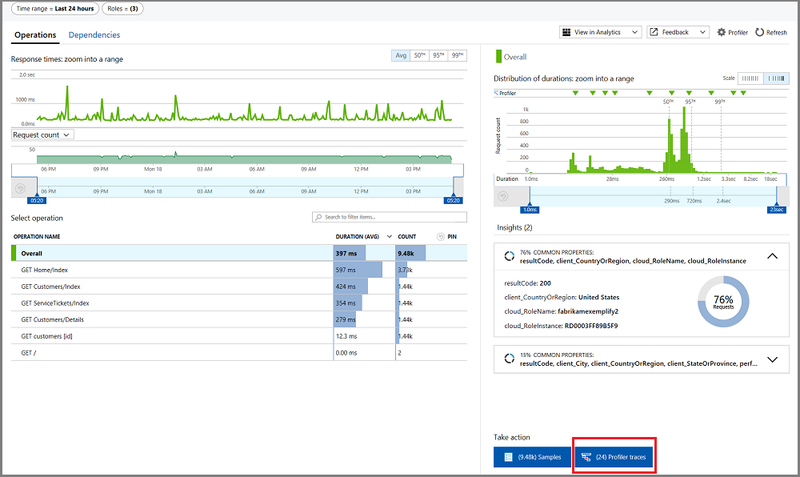 Azure Application Insights Profiler provides performance traces for applications that are running in production in Azure. Profiler captures the data automatically at scale without negatively affecting your users. Profiler helps you identify the “hot” code path that takes the longest time when it's handling a particular web request. Profiler works with .NET applications that are deployed on the following Azure services. Specific instructions for enabling Profiler for each service type are in the links below. If you've enabled Profiler but aren't seeing traces, check our Troubleshooting guide. For Profiler to upload traces, your application must be actively handling requests. 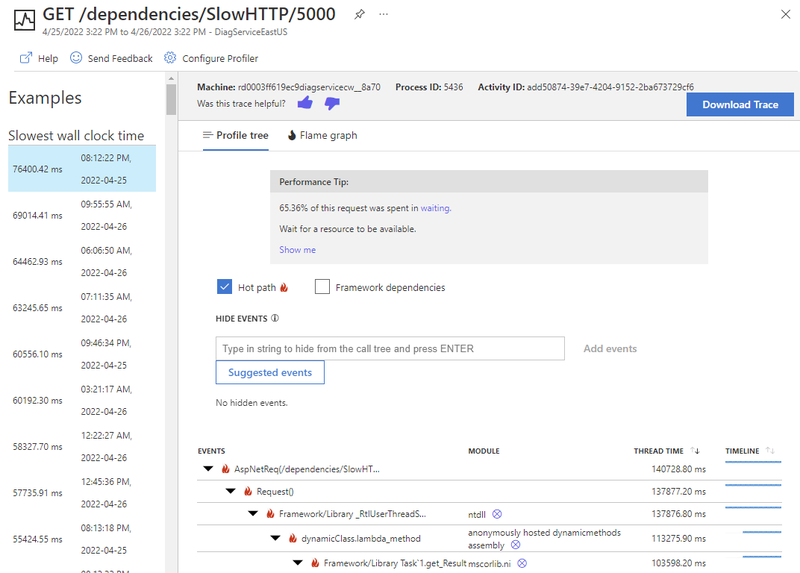 If you're doing an experiment, you can generate requests to your web app by using Application Insights performance testing. If you've newly enabled Profiler, you can run a short load test. While the load test is running, select the Profile Now button on the Profiler Settings pane. When Profiler is running, it profiles randomly about once per hour and for a duration of two minutes. If your application is handling a steady stream of requests, Profiler uploads traces every hour. After your application receives some traffic and Profiler has had time to upload the traces, you should have traces to view. This process can take 5 to 10 minutes. To view traces, in the Performance pane, select Take Actions, and then select the Profiler Traces button. Select a sample to display a code-level breakdown of time spent executing the request. Show Hot Path: Opens the biggest leaf node, or at least something close. In most cases, this node is near a performance bottleneck. Label: The name of the function or event. The tree displays a mix of code and events that occurred, such as SQL and HTTP events. The top event represents the overall request duration. Elapsed: The time interval between the start of the operation and the end of the operation. When: The time when the function or event was running in relation to other functions. The Microsoft service profiler uses a combination of sampling methods and instrumentation to analyze the performance of your application. When detailed collection is in progress, the service profiler samples the instruction pointer of each machine CPU every millisecond. Each sample captures the complete call stack of the thread that's currently executing. It gives detailed information about what that thread was doing, at both a high level and a low level of abstraction. The service profiler also collects other events to track activity correlation and causality, including context switching events, Task Parallel Library (TPL) events, and thread pool events. The call stack that's displayed in the timeline view is the result of the sampling and instrumentation. Because each sample captures the complete call stack of the thread, it includes code from Microsoft .NET Framework and from other frameworks that you reference. clr!JIT_New and clr!JIT_Newarr1 are helper functions in .NET Framework that allocate memory from a managed heap. clr!JIT_New is invoked when an object is allocated. clr!JIT_Newarr1 is invoked when an object array is allocated. These two functions are usually fast and take relatively small amounts of time. If clr!JIT_New or clr!JIT_Newarr1 takes a lot of time in your timeline, the code might be allocating many objects and consuming significant amounts of memory. clr!ThePreStub is a helper function in .NET Framework that prepares the code to execute for the first time. This execution usually includes, but isn't limited to, just-in-time (JIT) compilation. For each C# method, clr!ThePreStub should be invoked at most once during a process. If clr!ThePreStub takes a long time for a request, the request is the first one to execute that method. The time for .NET Framework runtime to load the first method is significant. You might consider using a warmup process that executes that portion of the code before your users access it, or consider running Native Image Generator (ngen.exe) on your assemblies. clr!JITutil_MonContention or clr!JITutil_MonEnterWorker indicates that the current thread is waiting for a lock to be released. This text is often displayed when you execute a C# LOCK statement, invoke the Monitor.Enter method, or invoke a method with the MethodImplOptions.Synchronized attribute. Lock contention usually occurs when thread A acquires a lock and thread B tries to acquire the same lock before thread A releases it. If the method name contains [COLD], such as mscorlib.ni! [COLD]System.Reflection.CustomAttribute.IsDefined, .NET Framework runtime is executing code for the first time that isn't optimized by profile-guided optimization. For each method, it should be displayed at most once during the process. If loading code takes a substantial amount of time for a request, the request is the first one to execute the unoptimized portion of the method. Consider using a warmup process that executes that portion of the code before your users access it. Methods such as HttpClient.Send indicate that the code is waiting for an HTTP request to be completed. Methods such as SqlCommand.Execute indicate that the code is waiting for a database operation to finish. AWAIT_TIME indicates that the code is waiting for another task to finish. This delay usually happens with the C# AWAIT statement. When the code does a C# AWAIT, the thread unwinds and returns control to the thread pool, and there's no thread that is blocked waiting for the AWAIT to finish. However, logically, the thread that did the AWAIT is "blocked," and it's waiting for the operation to finish. The AWAIT_TIME statement indicates the blocked time waiting for the task to finish. BLOCKED_TIME indicates that the code is waiting for another resource to be available. For example, it might be waiting for a synchronization object, for a thread to be available, or for a request to finish. .NET framework emits ETW events and passes activity ids between threads so that async calls can be tracked across threads. Unmanaged code (native code) and some older styles of asynchronous code are missing these events and activity ids, so the profiler cannot tell what thread and what functions are running on the thread. This is labeled 'Unmanaged Async' in the call stack. If you download the ETW file, you may be able to use PerfView to get more insight into what is happening. The CPU is busy executing the instructions. The application is performing disk operations. The application is performing network operations. The When column is a visualization of how the INCLUSIVE samples collected for a node vary over time. The total range of the request is divided into 32 time buckets. The inclusive samples for that node are accumulated in those 32 buckets. Each bucket is represented as a bar. The height of the bar represents a scaled value. For nodes that are marked CPU_TIME or BLOCKED_TIME, or where there is an obvious relationship to consuming a resource (for example, a CPU, disk, or thread), the bar represents the consumption of one of the resources during the bucket. For these metrics, it's possible to get a value of greater than 100 percent by consuming multiple resources. For example, if you use, on average, two CPUs during an interval, you get 200 percent. The default data retention period is five days. The maximum data that's ingested per day is 10 GB. There are no charges for using the Profiler service. For you to use it, your web app must be hosted in at least the basic tier of the Web Apps feature of Azure App Service. Profiler randomly runs two minutes every hour on each virtual machine that hosts the application that has Profiler enabled for capturing traces. When Profiler is running, it adds from 5 to 15 percent CPU overhead to the server.